A week ago I was going through my stacks of magazines, ripping out pages so I could throw away the rest and save space. I clip magazine images for three purposes: (1) decoupage, (2) drawing practice, and (3) inspiration. The drawing-practice images are mostly faces and figures, and since it’s been so long since I’ve done any figure drawing, looking at the magazine photos made me itchy to get back to it. 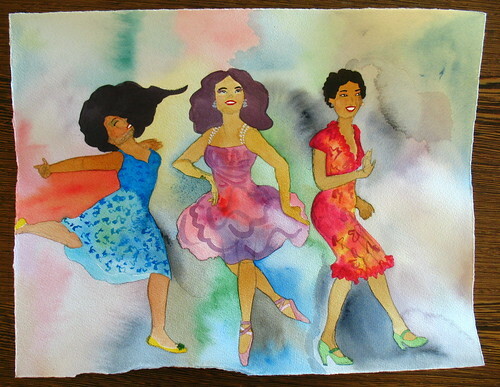 I wanted to do something fashion-y and exuberantly colorful, so I selected three photos of dancers (Alexandra Beller, Anna Pavlova, and an African-American couple from the 1930s or 40s whose names I neglected to cut out with the photo) and used those as reference models for my painting. I’m happy to report that copying (freehand, not tracing) reference photos is pretty easy for me now. Most of the time, I get the big things right, and when I don’t, I usually notice and can see what I did wrong. I think art-making is half technique and half “eye.” You might think “able to notice what went wrong” is a basic skill, but it’s not; it’s one that develops more and more with time, and that development is one reason that artists’ early work often looks less skilled than what they do later. It’s also the reason that I’m so perpetually unsatisfied with my work. My technique always improves less quickly than my eye does, and so I can always find flaws! But I think that’s a good thing. I also think I’m getting better at color-mixing and at understanding the paint-to-water ratio required for really vibrant colors (and I’m learning the way watercolors fade as they dry). 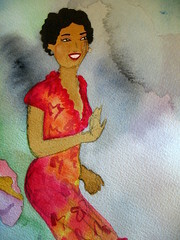 But I have a long way to go before optimal partnering of my art style and the watercolor medium. I was looking over this painting after I finished it, and it reminded me so much of my Drawgasmic piece, except I did that one with markers and pens. 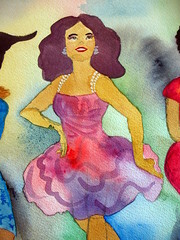 I’m pretty good with colors, but I think I’m still using the watercolors as if they were markers, and not taking full enough advantage of the unique qualities of the paints themselves. To that end, I went online and hunted up a bunch of beginning watercolor books, and requested from the library those that got the best reviews on Amazon. Yes, I just took a watercolor class, but it wasn’t very technique-based, and I think I need more of that (but on my own schedule). It’s odd; as a writer I’m not usually fazed by large blocks of text, but when I look at art-instruction books, I hate seeing words. Maybe it’s a left-brain/right-brain thing. Anyway, it goes against the grain for me to seek out art-instruction books and actually sit down to read and practice with them. I’m hoping the watercolor books will change that, because I really would like to get good at painting, and I think the books can help me there. I also decided, after making this painting, that I need to make better use of my palettes. I have several, and because my work space is relatively small (and has myriad surfaces I can’t drip paint on), they’re all little. Right now I work primarily off of the tiniest of these palettes, just because it has the most color wells, but it’s stupid not to use all my palettes just because I feel lazy about digging them out whenever I paint. So I’m going to keep my eyes peeled for clear plastic plates or lids that I can use to cover the palettes — so I can stack them — and I’ll dedicate each to a different family of colors. This one is for skin tones. 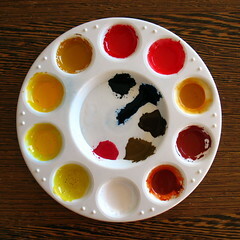 These are just the raw colors; I’ll have to do the actual mixing on a different palette. Hi Lisa! Love the painting– you did an awesome job and the colors are awesome! Ooh la la!! I LOVE your new painting! 😀 The colors are just wonderful, and you did an absolutely amazing job of capturing the motion (and emotion) of the dancers. Wow. Thank you, Mo!! 🙂 All three original photos were so incredible, it was a pleasure trying to translate them. One of the watercolor books I’ve found has the most wonderful way of dealing with the instructions: instead of having big blocks of text, it uses a lot of cartoonlike diagrams, so I feel like I’m looking into an artist’s sketchbook instead of reading some kind of manual. I’ll probably blog about it on a different day, but in case I don’t get around to it, this is it. Lisa, I totally understand that you are adjusting your schedule as priorities change. But, ouch, we will sure miss you. If nagging will work, I’ll give it a try! Watching you blossom these past few months has been a joy. But, as well as that, I am learning so much from you. 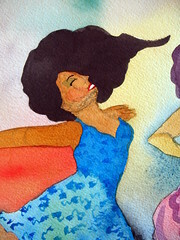 Todays watercolor pictures are vivid, jubilant, and fun. When you get your books from the library, share with us the names of those you think are the most helpful. Who would have thought that palletes were almost a book unto themselves! I am with you on the text thing too. Sherry, nag away as you wish! 🙂 I’m so touched by your words, and continually motivated by your encouragement! I do very much intend to keep blogging, so thank you for sticking with me as I figure out how to reinterpret the space to fit my priorities. So far, I’ve really liked this book (as I mentioned in my reply to Mo, above), and I also appreciate the super-supportive tone in this one. They’re already inspiring me to try new things! Sure thing, Sherry. If I find other good ones, I’ll post about them too!